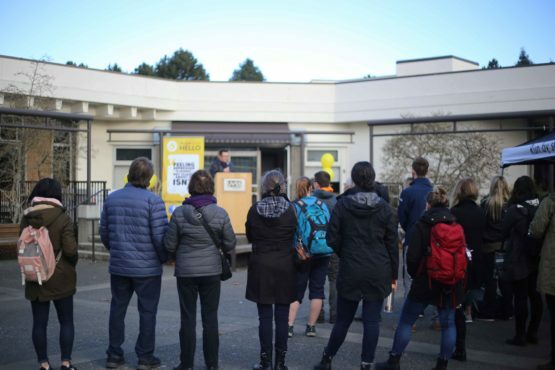 In the midst of the grey and dreary Victoria ‘winter’ weather, Mother Nature prevailed by shining down on the UVic campus on the same day another bright addition to the university was announced. 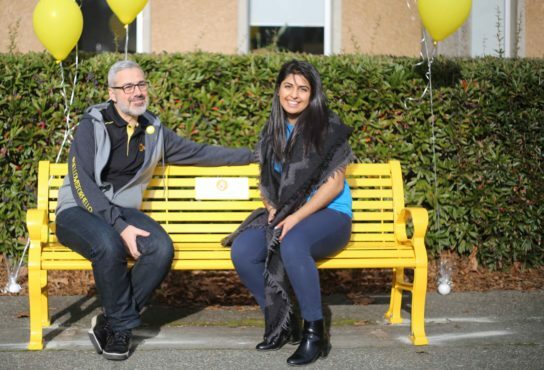 On Jan. 16, a remarkably sunny day, the UVSS unveiled the vibrant yellow “Friendship Bench” outside the Student Union Building. 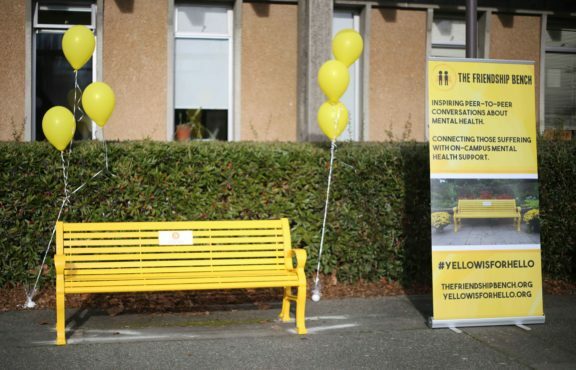 The initiative is part of a nationwide ‘Yellow is For Hello’ campaign that aims to remove stigma surrounding mental health. The Friendship Bench not-for-profit initiative started in April of 2015 after Lucas Fiorella, a Carleton University student battling depression, took his own life. Lucas was well-known for taking time out of his day to check-in on his friends and their mental state, simply by saying, “hello.” The gratitude for his support of his friends in their time of need sparked the name for the campaign. A crowd of about 30 people including students, faculty, and parents crowded outside the SUB for the grand unveiling. Included in the ceremony was the appearance of Yellow is For Hello co-founder Sam Fiorella, Lucas’s father, who flew in from Ontario for the event. He joked he was the reason for the unseasonably warm weather in Victoria. Fiorella continued his speech by listing facts about the campaign’s history, where he hopes the initiative will go in the future, and the goals for the bench here on campus. Later, Fiorella addressed the unique colour of the bench, yet reiterated that he didn’t want this bench to seem more special than a regular one. Despite the smiles from the crowd that gathered for the unveiling of the bench, Fiorella admitted it’s difficult being reminded that Lucas is not here anymore. Present at the ceremony was UVSS Director of Campaigns and Community Relations Anmol Swaich, who played a vital role in bringing the bench to campus. 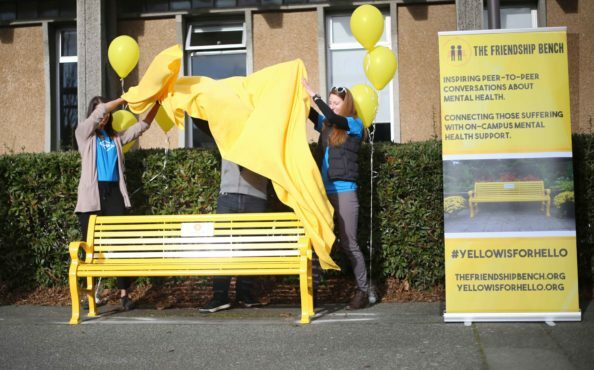 Swaich hopes that the UVic Friendship Bench will be a permanent physical reminder for students to prioritize the importance of their mental health. “Sometimes you’re walking from class and you’re just exhausted, tired, and feel like everything is going wrong because [you’re] doing something wrong. But the reality is that life is life and mental health plays into everything,” Swaich said. Included on the bench is a plaque with the ‘yellow for hello.org’ link which directs students to mental health resources on and off campus. Students that access the link on campus won’t have to worry about navigating the UVic website to find mental health resources. The Yellow is For Hello website asks to use your current location on your smartphone, and by using the UVic location, it directly leads students to the resources available here on campus. “[The Friendship Bench] is just a reminder to take care of yourself, and take a minute to take a step back out of the situation and realize you’re just a person and life is just happening,” Swaich said. Overall, the UVic Friendship bench is the 37th installment on a university campus or high school property in Canada, and the seventh in B.C. Fiorella concluded the mental health celebration by acknowledging the students at UVic.